In a bucket, add boiled water and soak your holi stained dresses in it. Add ½ cup of sugar and allow it to cool. Now add detergent and wash your clothes normally. Soak your holi coloured white dress in a bucket with full of warm water. Add non-chlorine bleach followed by the normal wash, as bleach is perfect to remove stains from white dresses. But be aware that do not mix chlorine and non-chlorine bleach together. Remember Bleach (chlorine) should never be used for the coloured dresses as it will remove the entire colour. Make sure you are using non-chlorine/ fabric, colour safe bleach or laundry brighteners only. 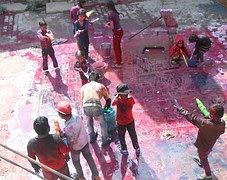 Try to wash your holi stained dresses as soon as possible. The more prompt you would be, the washing game would be much easier. Lemons come in handy often. Try to rub some lemon juice on the stains and keep for some time. Gently scrub and follow with a normal wash. In a bucket full of cold water, add ½ cup white vinegar and 1 tsp detergent. Now wash your dresses as usual. The acid trick does its stain removal job well. You can use methylated spirits (alcohol) on the stains. Follow with a normal wash with cold water. Do You Have Any Other Idea Of Removing The Holi Stain From Clothes? Have You Ever Tried These Methods? Please Share With Me In the Comment Section Below. Great tips.. I didn't know that lemon helps to remove the stain. 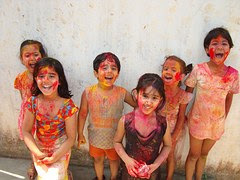 Let's have celebrate holi with the indiarush.com. This is providing best holi offers. Lemon and vinegar both are mild bleaching agents and work well on many kind of stains. Nice tips!